With the current proliferation of TV channels, documentaries are enjoying an unprecedented boom fuelled by audiences seeking alternative programming. But now documentary filmmaking, too, finds itself constrained by the imperatives of television. The chief culprit is the so-called "universal clock," a straitjacket that imposes theme and running-time restrictions to meet the demands of the global market. However, there is a rebel resisting this uniformity of the spirit. Among documentary filmmakers concerned about this mind-numbing standardization, Peter Watkins is preeminent, and has never strayed from either his principles or the cause. For the last three decades he has proven that films may be made without compromise. He continues to work outside the regular boundaries, austere dedication being his only rule for success. An enemy of television's "Monoform" - a concept whose mechanism and perverse effects are explained in detail - he is constantly inventing new ways to film. 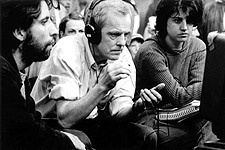 We see Watkins in Paris shooting La Commune (also distributed by First Run / Icarus Films), a six-hour film on the bloody insurrection that shook the French capital in 1871. On the set, 200 non-professionals - invited to play an active role in the development of their character - come and go in period costume. The cast members adapt their roles to their respective personalities, for the filmmaker has ingeniously assigned a number of his 'actors' parts that, although separated by more than a century, are similar and relevant to the individual's contemporary existence. Some of the cast members so appreciate this chance to participate in the creation of the film that they in turn reflect upon their own perception of what they watch on television. Could there be an alternative to the standardized, run-of-the-mill broadcasting? We are harshly reminded of the reality when, as a stark counterpoint, the camera takes us through the corridors of MIP-TV in Cannes, the annual international television market where industry strategists define standards, negotiate lucrative deals and adjust their famous clock to meet the dictates of globalization. The strategy: to produce a commodity that can be adapted to the greatest number of countries, with the least regard for regional or cultural particularities. This is admitted with an almost unconcealed cynicism, such is the supremacy of the decision-makers in the world of television. How, then, do we regain our liberty as television viewers? How can we reverse the trend and impose a true diversity of choice? Perhaps by reviving the spirit of resistance that drove the rebellious Communards of 1871, as suggested by that permanent rebel, the great Peter Watkins. The most recent film by Peter Watkins. A 5 hour 45 minute event. Based on a thorough historical research into the Paris Commune of 1871, this film leads to an inevitable reflection about the present.